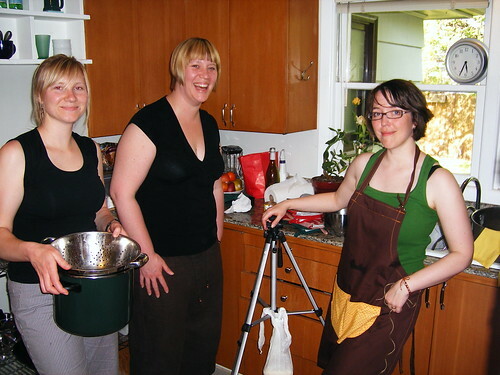 For our huge mozzarella/ricotta/whey day experiment, I came up with the “brilliant” idea to use an old camera tripod. It worked, for sure, but was a little crazy and took up a lot of space. One day, at the grocery store, I came across this jelly strainer. And I thought that this might work even better and be a little more compact. We used it for draining our cheddar. It actually worked pretty well. The jelly strainer is essentially a hoop with three legs that screw into it. The legs have a little foot and you can perch it on top of a modest sized stockpot. Bonus is that it is easy to store away. 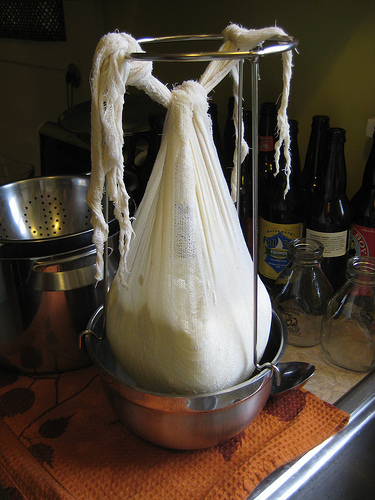 When we did our goat cheese day and made two batches of fromage blanc, one with fresh goats milk and one from cow, we kind of scrambled around to figure out how to hang them. I don’t think I had the jelly strainer at that time and, anyway, it wouldn’t have worked for two. So, we ended up improvising by hanging the cheese from a broomstick, balanced between a bult-in and a desk. Not pretty, but it worked! 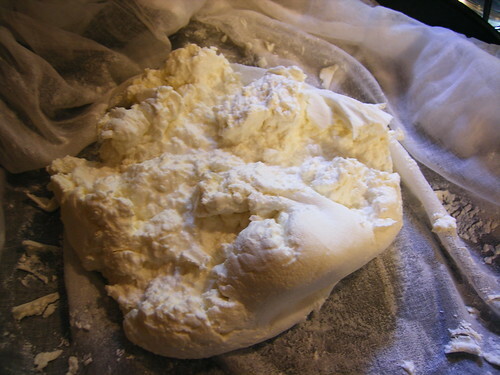 When we made mascarpone, the directions said that we should allow the cheese to drain in the fridge. Hmmm… another conundrum. We ended up with a colander, a wooden spoon and a casserole dish to catch the whey. Really, I could have just balanced it on a stockpot but I couldn’t fit that in my fridge at the time. Any other kind of bowl which will allow the whey to flow away would work as well. Lastly, if you have the right kind of cabinet handles in your kitchen, you could fashion some kind of hook and hang the cheese from the cupboard handles. Here I’ve used a chopstick to hang the draining cheese over a pot between my closed cupboard handles. Granted, the drawback here is that you’ve made accessing your cabinet a bit of a pain and, for a small kitchen like my own, I wouldn’t want to give over such prominent counter space for a long draining session. 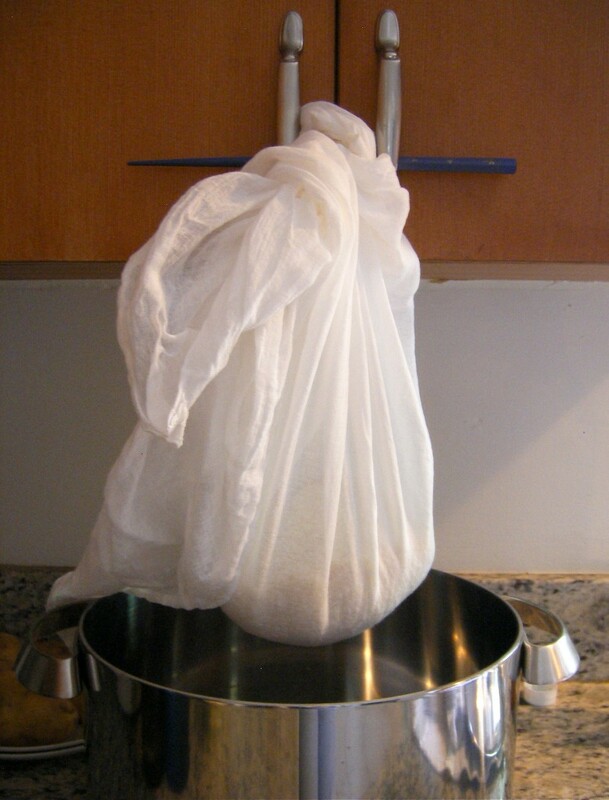 However, if you draining overnight something like this could work in a pinch. 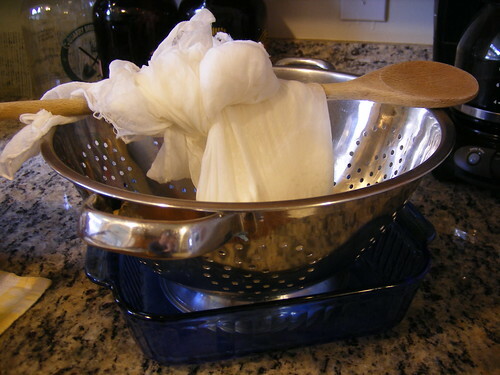 Would love to hear of any inventive ways that you’ve drained your cheese. Just putting this together has inspired in me to once again go looking for a spot where I could hang a hook just for this purpose. UPDATE! 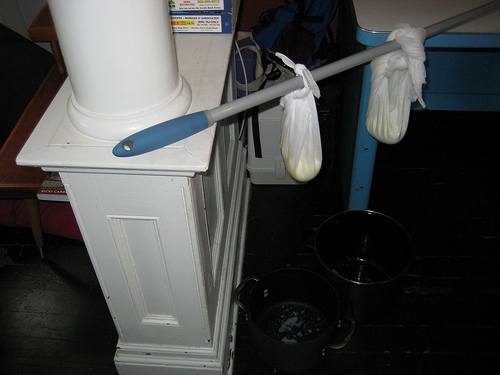 Just saw this post from Urban Cheesecraft for draining cheese using a banana hanger — brilliant! Ha ha! The banana holder method has been my fave (only good for a gallon, too short otherwise), but all of your ideas are great…I will never look at tripods and brooms the same way again. I love all the crafty photos! What a great post!!! Very informative with great photos.